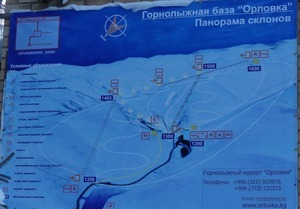 The Orlovka Ski resort is located 90 km from Bishkek city. The Orlovka is a perfect place as for the professionals as for the beginners because the resort is equipped with 9 ski routes of different complicity level. The length of the routes varies from 150 to 2890 m and the overfall varies from 30 to 560 m. All the ski routes are prepared by snowcat. There is also a snow cannon. At the territory of the resort there are 2 ski lifts and 2 rope tows. The length of the elevation of the ski lift varies from 500 to 900 m with height overfall from 110 to 350 m; average speed of the ski lift is 3 m/s. The length of the elevation of the rope tows varies from 150 to 600 m with height overfall from 30 to 120 m; average speed of the rope tows is 2 m/s. At the territory of the resort there is a rental agency for those who have not bought ski equipment yet. There you will be supplied with the best ski equipment.